I've been considering something similar and it is nice to see it somewhere other than my mind. 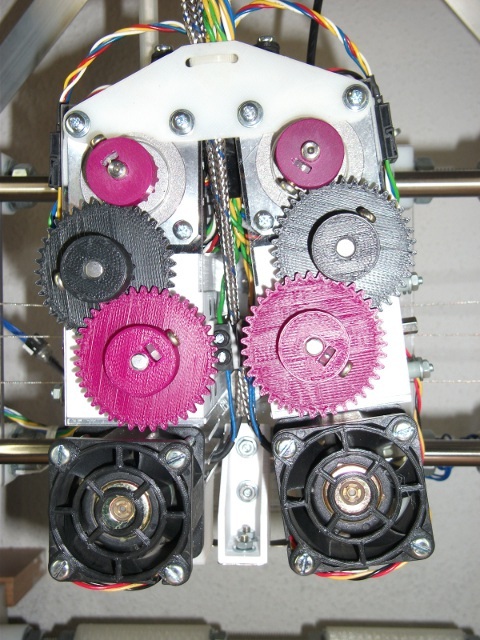 Have you experimented with trying to do it with one stepper motor, using the servo as a way to choose which extruder's gears are engaged? You could actually get away with one stepper in the middle and just have the gears engage when the mechanism moves side to side. Exactly, and in doing so you would reduce the mass of the carriage by quite a lot. Did you have the chance to extensively test this? Is it a public design? I tested it with a 12H white ABS/PLA print, the system didn't fail but I need to do some improvements on the ABS side. The print was contaminated by burned ABS that was in contact with the nozzle for too long. I am working on a wipe system to solve this issue. Oh well.. If you've got more videos of the current tests, feel free to post them. The system looks promising, it would be great if you could make it work. Pretty sure Stratasys has a patent on a rocking dual extruder setup. You're probably ok for personal use but you may want to look up the patent before you sell/release it. I like your nozzle wiping solution, that's pretty clever. I'm currently experimenting with dual extrusion too and after googleing for a good anti-ooze solution I found this topic. I really like the concept and would like to test this at home. I already downloaded the files and made some changes to fit everything on my printer. The only thing I don't know is how you control the servo to move the nozzles up (and down) when needed. Do you connect the servo directly to the pcb, change the firmware and use some special gcode? Or do you use another (easyer) way to do that? Edited 2 time(s). Last edit at 05/28/2013 02:47AM by isphording90. My printer works with linux CNC so I use an output on the parallel port. There is still some brown ABS on the print but it's much better than before. The current is limited to 400mA during ~0.5s and fall to 200mA after to maintain the position.